This list of Pilgrimage Site are the Verso Ministries Top Pilgrimage Sites in Region 10. The Regions that will be used for all of our lists are based off of the Regions used by the National Federation for Catholic Youth Ministry (NFCYM) and used for the Bishop Conferences. These resources are here for Youth Groups, Young Adults, and Individuals to be able to find local sites to go on Pilgrimage to. The Basilica of Our Lady of San Juan de Valle National Shrine began with a small wooden chapel built in 1920 as a mission Church. It was rededicated in 1949 to Our Lady of San Juan de Valle. The Holy Mother interceded on the behalf of a mother and father who had lost their daughter in an accident. An image of Mary was placed over the daughter’s body and they prayed to her in hopes that God would raise their daughter from the dead, which He did. This miracle in San Juan in 1623 began a deep running devotion that became the center of the newfound Shrine. With over 65 Acres of land, this Shrine is a beautiful testament to the natural glory of Texas. But even more beautiful than that is the Basilica itself. This holy temple of the Lord is the perfect site for prayer and worship as an individual or group. Honor the Blessed Mother and her miracle in San Juan in prayer and by glorifying God through your prayers that you offer. It is a true blessing to be able to visit this special and unique Shrine and I strongly encourage anybody who has a chance to go to it to do so. Originally built as a Church for the growing population of Italian immigrants in Dickinson during the start of the 20th Century, the Shrine became dedicated and given its name on September 13th, 1936. Hosting one of the Relics of the True Cross, which legend holds was founded by St. Helena in 326 AD, this Shrine is a place of great reverence and remembrance. All that is there goes beyond the usual memory of the Crucifixion that we find within the Stations of the Cross or a Crucifix as we come face to face with a piece of the wood that Our Savior died upon. The veneration of this Relic is a special honor and opportunity that is rare for most people to ever be able to receive. So I encourage you to take advantage of this chance to encounter that on which hung the Savior of the world. It was by this wood that Salvation came to man and in venerating it, we remember now just the death of Christ but the coming Resurrection that followed only a short time after. Let it be a reminder to us all that our death is always before us, but just beyond that, because of Jesus, life eternal awaits all of us! 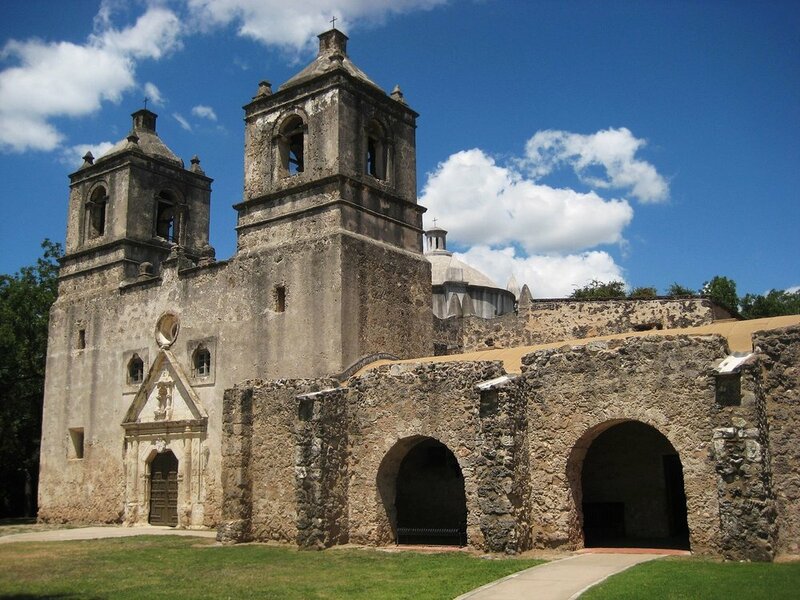 In 1632 the first Spanish Mission was founded in what is now present day San Angelo. San Clemente would however only be the first of thirty five Missions built over the next 150 years by the Religious brothers and priests who came over from Spain. These missions span from the easternmost parts of Texas all the way to its westernmost tip. Some of these Missions remain as Churches today while others, like the Alamo, were turned into forts, historic sites, or even abandoned and fell into disrepair. Today, many of these Missions are still open for visits and in towns that have multiple Missions, there is the great opportunity to create a pilgrimage for a group. In El Paso and San Antonio especially, you have the opportunity to visit multiple Missions in one day and it would be strongly encouraged to turn this journey into a spiritual pilgrimage along the way as you move from one Mission to the next, meditating upon what the lives of the people who lived here might be like. As a major part of Texan and American history, these sites give us the opportunity to reflect upon our forebearers in faith who helped to bring to life Christianity during such an early time in our nation’s history. The National Shrine of the Infant Jesus is hosted in the the parish Church of Saint Wenceslaus. The devotion to the Infant Jesus of Prague began when the pastor visited his dying mother in California and was offered a statue of the Infant of Prague by the hospital sisters there. Accepting their generous gift, the statue was brought back to the parish of Saint Wenceslaus and copies of devotionals to the Infant of Prague were handed out to parishioners. As devotion spread, prayers asked of the Infant Jesus were answered and the word continued to spread. Eventually the pastor offered promised Christ that he would build a Shrine for the statue as long as enough money came in to build a new Church to fit the growing parish. As we now know today, his prayer was answered and we are left with the beautiful Church and Shrine in Oklahoma. Even though devotion to the Infant of Prague spans all the way back to Prague, Czech Republic in the 16th century, the people of Prague, Oklahoma have taken the Infant into their lives as a member of great importance. So I encourage you to have the same total faith in the works of Christ and visit this Shrine to both honor Him and ask Him to hear any petition that you might have. He will surely hear it and answer it in ways you would never expect! Subiaco Abbey was founded in 1879 as a new home for some of the Benedictine Monks from Saint Meinrad, Indiana who heard the call to help spread the Gospel message to all of the new people beginning to live in Arkansas. They were joined on this adventure by a few of the Benedictine Sisters from Ferdinand, Indiana who would go on to found their own Monastery in Fort Smith, Arkansas as well. The Monks live lives nearly identical to their brother-house up in Indiana as work and prayer drive their daily living. They are also known for their great and generous hospitality and so people are welcome to come and wander the grounds and join them for prayer at any time. Whether you want a professional tour from one of the Monks (which I strongly encourage) or just want to go spend some time on your own exploring the grounds, there is nothing like the experience of the Benedictine spirit of serenity that you will receive while there. So I strongly encourage you to make at least a day trip to this holy ground or even consider making a full retreat as those are offered too. After all, there is no place like a Benedictine Abbey to help you refuel spiritually and become prepared to go back out into the world again!